Options 50 to 100 lbs - Large - 8 Treats, 12oz. 50 to 100 lbs - Large - 12 Treats, 18oz. 50 to 100 lbs - Large - 17 Treats, 27oz. 25 to 50 lbs - Regular - 6 Treats, 6oz. 25 to 50 lbs - Regular - 12 Treats, 12oz. 25 to 50 lbs - Regular - 18 Treats, 18oz. 25 to 50 lbs - Regular - 27 Treats, 27oz. 15 to 25 lbs - Petite - 10 Treats, 6oz. 15 to 25 lbs - Petite - 20 Treats, 12oz. 15 to 25 lbs - Petite - 30 Treats, 18oz. 15 to 25 lbs - Petite - 45 Treats, 27oz. 5 to 15 lbs - Teenie - 22 Treats, 6oz. 5 to 15 lbs - Teenie - 43 Treats, 12oz. 5 to 15 lbs - Teenie - 65 Treats, 18oz. 5 to 15 lbs - Teenie - 96 Treats, 27oz. 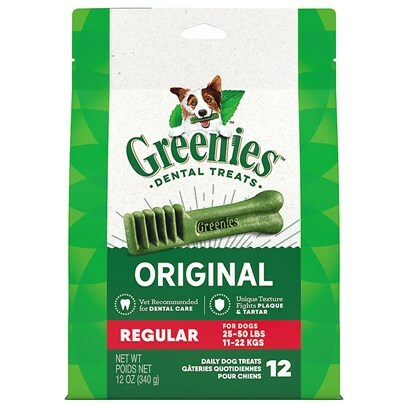 Greenies are easily digestible, toothbrush shaped, chewy dental treats, containing 52% high-quality proteins, fiber, antioxidants from fruits and vegetables, and chlorophyll for dental health. These tasty treats are textured to aid in plaque reduction, and the signature tooth-brush shape is designed specifically to maximize plaque and tartar removal. Greenies are available in sizes based on dog's skull size, and are for dogs and pups 6 months and older, weighing 5 pounds or more. Visit our Greenies Page for top Greenies products, related articles, and information. The chlorophyll contained in Greenies may give a greenish look to the dog’s stool. Gelatin, wheat protein isolate, glycerin, soy protein isolate, sodium caseinate, natural poultry flavor, hydrogenated starch hydrolysate, lecithin, vegetable oil (preserved with mixed tocopherols), minerals (magnesium amino acid chelate, calcium carbonate, zinc sulfate, ferrous sulfate, copper sulfate, manganese sulfate, calcium pantothenate, potassium iodide), vitamins (dl-alpha-tocopherol acetate [source of vitamin E], L-ascorbyl-2-polyphosphate [source of vitamin C], vitamin B12 supplement, niacin supplement, vitamin A supplement, riboflavin supplement, vitamin D3 supplement, biotin, pyridoxine hydrochloride [vitamin B6], thiamine mononitrate [vitamin B1], folic acid), dehydrated tomato, apple pomace, ground flaxseed, dehydrated sweet potato, cranberry fiber, potassium sorbate (to preserve freshness), choline chloride, taurine, carotene, chlorophyll. Greenies are for use on dogs of 5lbs. or more and above 6 months of age. *Keep fresh drinking water available to dogs using Greenies.